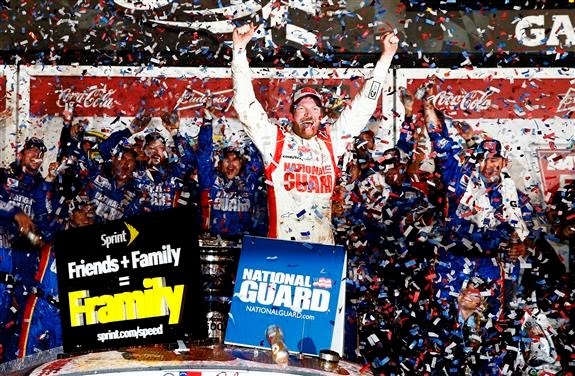 It was a glorious start to the 2014 NASCAR Sprint Cup Series season for the #88 Hendrick Motorsports team at the prestigious Daytona International Speedway. Piloting the National Guard sponsored Chevrolet SS, Dale Earnhardt Jr. won his second Daytona 500 race. His 2014 victory comes a little more than 10 years after his first victory in the sought-after 500-mile race on the 2.5 mile tri-oval. For users of one of the world's most popular social media sites, Dale Earnhardt Jr.'s win at the Great American Race also resulted in victory. Following the #88 Chevrolet race car's streak across the finish line first, Michael Waltrip mentioned that NASCAR's most popular driver would join Twitter. On Monday morning at 2:32 A.M. eastern time, Dale Earnhardt Jr.'s official account tweeted its first message. On Wednesday, his Twitter audience rapidly exceeded 500,000 followers. As of Thursday morning, @DaleJr (Dale Earnhardt Jr.'s official account) stands at over 518,000 followers and climbing. With the message, "Tonight seemed like as good a night as any to join Twitter. How is everyone doin?" and the hashtag, "#2XDaytona500Champ", the authorized Twitter account @DaleJr came online. The first Twitter post also featured a shot of the Harley Earl trophy belonging to the 2014 Daytona 500 winner. Four days since posting the message, the initial tweet was retweeted 16,226 times and favorited 27,950 times. By early Thursday, Earnhardt Jr. has posted 92 tweets through his account. Showing instant mastery of the high-tech service posting pictures as well as using hashtags, Dale Earnhardt Jr. is already surpassing many long-established official Twitter account operated by NASCAR Sprint Cup drivers. Becoming a social media star in 2012 as a result of some live-tweeting during a race delay at the Daytona 500, driver of the Penske Racing #2 machine Brad Keselowski received a massive spike in Twitter followers. Currently at over 470,000 followers, Keselowski was recently eclipsed by Earnhardt Jr,'s mounting follower count. In a Twitter response late Wednesday, Brad Keselowski posted "I'd say @DaleJr is getting a hang of this tweeter 😉". With 510,000 followers, Earnhardt Jr. has also passed his Hendrick Motorsports teammate Jeff Gordon. The driver of the #88 car is still currently trailing his teammate driving the #48 on the Twitterverse. Six-time NASCAR Sprint Cup champion Jimmie Johnson stands at more than 550,000 followers on the social media site. The NASCAR driver at the peak of Twitter popularity has been IndyCar transplant and highly-publicized female driver Danica Patrick. Days before Dale Earnhardt Jr joined the social media community, NASCAR-related Twitter news broke that Danica Patrick became the first of the stock car series to exceed one million followers. Before his official account became active on Monday, Dale Earnhardt Jr was one of the last NASCAR drivers to not join the social media service. In 2012, I composed a directory of NASCAR Twitter account noting almost every driver operated with a Twitter handle. Dale Earnhardt Jr. along with Dave Blaney and Paul Menard were among the only drivers in the Sprint Cup series not part of Twitter at that time. Weeks after I posted the list, Dave Blaney has Tweeted under the handle @BuckeyeBullet10 (although activity in light at just 25 tweets in almost two years). As of February 2014, Paul Menard is only of the last remaining holdouts. However, fans of micro blogging channel can turn to his Richard Childress Racing team's official account at @RCR27PMenard for updates. Also want to add that Roush Fenway driver Carl Edwards is not on Twitter. Edwards had maintained an active Facebook account but no updates have been provided since 2012.